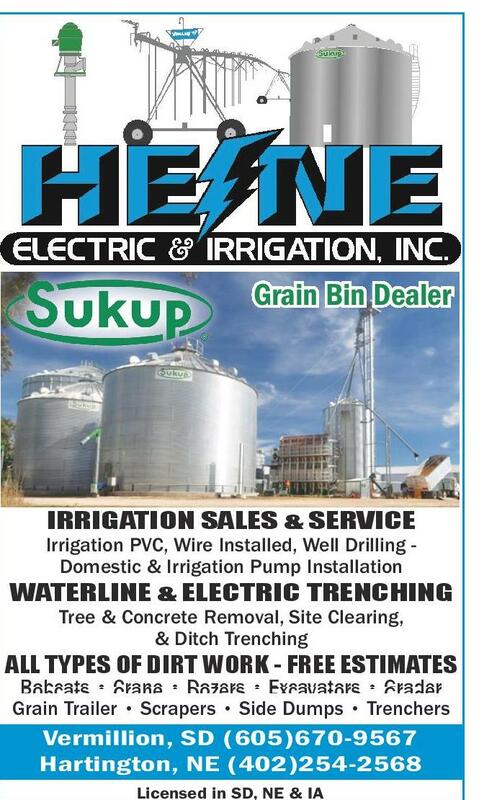 Heine Electric and Irragation Inc.
2 Broadcaster Press February 19, 2019 www.broadcasteronline.com SCHOOL LUNCH MENUS Menus listed below are for February 20 – February 26. Menus are subject to change without notice. Vermillion Schools Breakfast Available everyday: Breakfast entrée or choice of cereals with toast. Fruit or Fruit Juice, Milk choices Wednesday – A. Egg & Cheese Omelet with Toast, B. Cereal Choices with Toast, Juice Choices, Whole Blueberries Thursday – A. Sausage Breakfast Pizza, B. Cereal Choices with Toast, Juice Choices, Sliced Peaches Friday – A. Fresh Baked Cinnamon Roll, B. Cereal Choices with Toast, Juice Choices, Sliced Pears Monday – A. Egg & Cheese Taco Roll B. Cereal Choices with Toast, Juice Choices, Mixed Fruit Cocktail Tuesday – A. Fresh Baked Sausage Biscuit Sandwich, B. Cereal Choices with Toast, Juice Choices, Fresh Apple Wedges Vermillion Elementary Schools Lunch Wednesday – A. Domino’s Pizza, B. Taquito, BBQ Baked Beans Thursday – A. Chicken Ranch Pasta, B. BBQ Rib Sandwich, Green Beans, Fresh Baked Chocolate Chip Cookie Friday – A. Cheeseburger Macaroni Skillet with Breadstick, B. Crispy Chicken Sandwich, Steamed Carrots Monday – A. Oven-Roasted Hot Dog, B. Cheeseburger Soup with Dinner Roll, Peas Tuesday – A. Mexi Tots with Dinner Roll, B. Chicken Fried Rice, Golden Corn Vermillion Middle School Lunch Wednesday – A. Domino’s Pizza, B. Crispy Chicken Sandwich, BBQ Baked Beans Thursday – A. Chicken Ranch Pasta, B. Fresh Baked Sub, Green Beans, Fresh Baked Chocolate Chip Cookie Friday – A. Cheeseburger Macaroni Skillet with Breadstick, B. Vegetarian Chef Salad with Roasted Flatbread, Steamed Carrots Monday – A. Cheeseburger Soup with Dinner Roll, B. Cheeseburger, Peas Tuesday – A. Mexi Tots with Dinner Roll, B. Fresh Baked Cheesy Pizza, Golden Corn Vermillion High School Lunch Wednesday – A. ‘Rito Incog-neato: Pork Carnitas ‘Rito, B. Fresh Baked Sub Station, Garlic Herb Roasted Carrots Thursday – A. 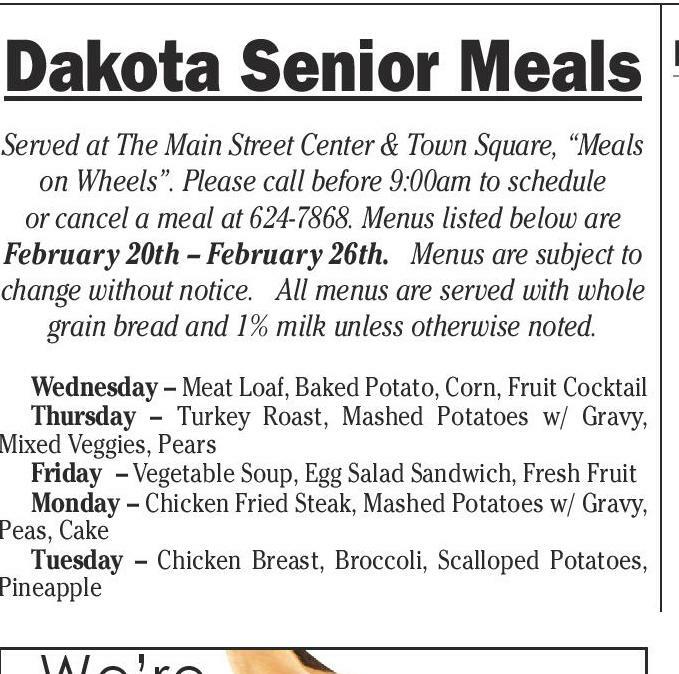 Chicken Ranch Pasta with Dinner Roll, B. Crispy Chicken Sandwich, Green Beans, Fresh Baked Chocolate Chip Dakota Senior Meals Served at The Main Street Center & Town Square, “Meals on Wheels”. Please call before 9:00am to schedule or cancel a meal at 624-7868. Menus listed below are February 20th – February 26th. Menus are subject to change without notice. All menus are served with whole grain bread and 1% milk unless otherwise noted. Wednesday – Meat Loaf, Baked Potato, Corn, Fruit Cocktail Thursday – Turkey Roast, Mashed Potatoes w/ Gravy, Mixed Veggies, Pears Friday – Vegetable Soup, Egg Salad Sandwich, Fresh Fruit Monday – Chicken Fried Steak, Mashed Potatoes w/ Gravy, Peas, Cake Tuesday – Chicken Breast, Broccoli, Scalloped Potatoes, Pineapple We’re all ears. Your opinion is something we always want to hear. Questions? Call, write us or contact Comments? us via e-mail and let us Story Ideas? know how we are doing. 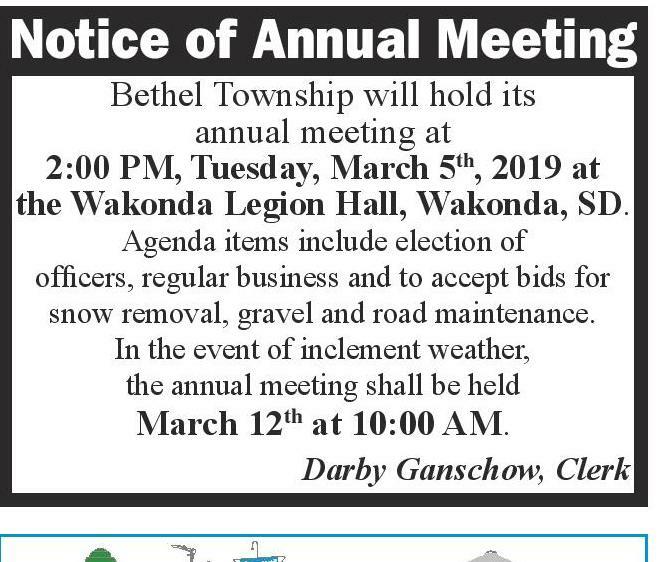 201 W. Cherry •Vermillion, SD 57069 605-624-4429 • classifieds@plaintalk.net Notice of Annual Meeting Bethel Township will hold its annual meeting at 2:00 PM, Tuesday, March 5th, 2019 at the Wakonda Legion Hall, Wakonda, SD. Agenda items include election of officers, regular business and to accept bids for snow removal, gravel and road maintenance. In the event of inclement weather, the annual meeting shall be held March 12th at 10:00 AM. Darby Ganschow, Clerk Tuesday – A. Fresh Baked Sausage Biscuit Sandwich, B. Cereal Choices with Toast, Fresh Apple Wedges, Juice Choices Cookie Friday – A. Domino’s Pizza, B. Taquito Grande with Dipping Sauce, BBQ Baked Beans Monday – A. Cheeseburger Soup with Dinner Roll, B. Cheeseburger, Peas Tuesday – A. Mexi Tots with Dinner Roll, B. Crispy Chicken Sandwich, Golden Corn Elk Point-Jefferson Elementary School Lunch Wednesday– A. 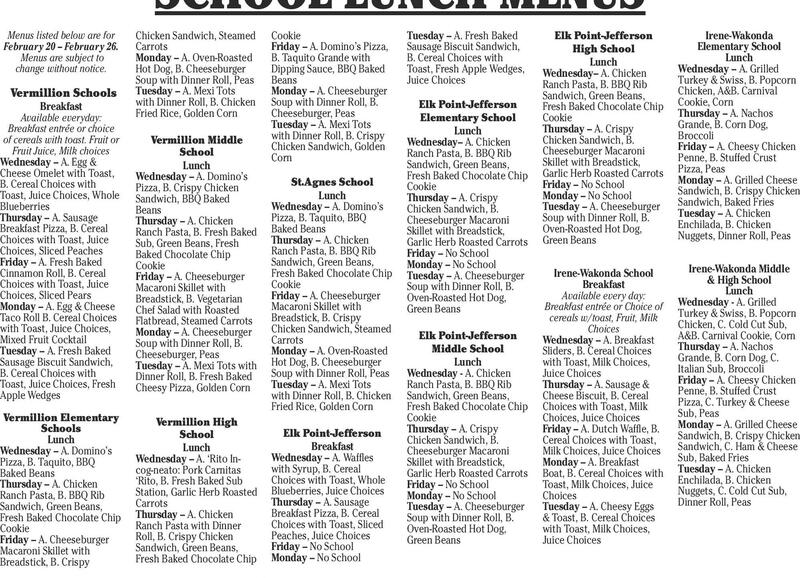 Chicken Ranch Pasta, B. BBQ Rib Sandwich, Green Beans, Fresh Baked Chocolate Chip Cookie Thursday – A. Crispy Chicken Sandwich, B. Cheeseburger Macaroni Skillet with Breadstick, Garlic Herb Roasted Carrots Friday – No School Monday – No School Tuesday – A. Cheeseburger Soup with Dinner Roll, B. Oven-Roasted Hot Dog, Green Beans St.Agnes School Lunch Wednesday – A. Domino’s Pizza, B. Taquito, BBQ Baked Beans Thursday – A. Chicken Ranch Pasta, B. BBQ Rib Sandwich, Green Beans, Fresh Baked Chocolate Chip Cookie Friday – A. Cheeseburger Macaroni Skillet with Breadstick, B. Crispy Chicken Sandwich, Steamed Carrots Monday – A. Oven-Roasted Hot Dog, B. Cheeseburger Soup with Dinner Roll, Peas Tuesday – A. Mexi Tots with Dinner Roll, B. Chicken Fried Rice, Golden Corn Elk Point-Jefferson Middle School Lunch Wednesday - A. Chicken Ranch Pasta, B. BBQ Rib Sandwich, Green Beans, Fresh Baked Chocolate Chip Cookie Thursday – A. Crispy Chicken Sandwich, B. Cheeseburger Macaroni Skillet with Breadstick, Garlic Herb Roasted Carrots Friday – No School Monday – No School Tuesday – A. Cheeseburger Soup with Dinner Roll, B. Oven-Roasted Hot Dog, Green Beans Elk Point-Jefferson Breakfast Wednesday – A. Waffles with Syrup, B. Cereal Choices with Toast, Whole Blueberries, Juice Choices Thursday – A. Sausage Breakfast Pizza, B. Cereal Choices with Toast, Sliced Peaches, Juice Choices Friday – No School Monday – No School Dave Says Elk Point-Jefferson High School Lunch Wednesday– A. Chicken Ranch Pasta, B. BBQ Rib Sandwich, Green Beans, Fresh Baked Chocolate Chip Cookie Thursday – A. Crispy Chicken Sandwich, B. Cheeseburger Macaroni Skillet with Breadstick, Garlic Herb Roasted Carrots Friday – No School Monday – No School Tuesday – A. Cheeseburger Soup with Dinner Roll, B. Oven-Roasted Hot Dog, Green Beans Irene-Wakonda Elementary School Lunch Wednesday – A. Grilled Turkey & Swiss, B. Popcorn Chicken, A&B. Carnival Cookie, Corn Thursday – A. Nachos Grande, B. Corn Dog, Broccoli Friday – A. Cheesy Chicken Penne, B. Stuffed Crust Pizza, Peas Monday – A. Grilled Cheese Sandwich, B. Crispy Chicken Sandwich, Baked Fries Tuesday – A. Chicken Enchilada, B. Chicken Nuggets, Dinner Roll, Peas Irene-Wakonda School Breakfast Available every day: Breakfast entrée or Choice of cereals w/toast, Fruit, Milk Choices Wednesday – A. Breakfast Sliders, B. Cereal Choices with Toast, Milk Choices, Juice Choices Thursday – A. Sausage & Cheese Biscuit, B. Cereal Choices with Toast, Milk Choices, Juice Choices Friday – A. Dutch Waffle, B. Cereal Choices with Toast, Milk Choices, Juice Choices Monday – A. Breakfast Boat, B. Cereal Choices with Toast, Milk Choices, Juice Choices Tuesday – A. Cheesy Eggs & Toast, B. Cereal Choices with Toast, Milk Choices, Juice Choices Irene-Wakonda Middle & High School Lunch Wednesday - A. Grilled Turkey & Swiss, B. Popcorn Chicken, C. Cold Cut Sub, A&B. Carnival Cookie, Corn Thursday – A. Nachos Grande, B. Corn Dog, C. Italian Sub, Broccoli Friday – A. Cheesy Chicken Penne, B. Stuffed Crust Pizza, C. Turkey & Cheese Sub, Peas Monday – A. Grilled Cheese Sandwich, B. Crispy Chicken Sandwich, C. Ham & Cheese Sub, Baked Fries Tuesday – A. Chicken Enchilada, B. Chicken Nuggets, C. Cold Cut Sub, Dinner Roll, Peas Zero Percent Interest? Dear Dave, I know you’re against financing purchases. However, is it okay to finance things like furniture at zero percent interest? Detrick Dear Detrick, We just finished an extensive study of more than 10,000 millionaires. Not a single one of these folks said they became rich by borrowing money to buy things at zero percent interest. Since none Dave of those millionaires gave credit for their wealth to zero percent interest financing, and since we know banks charge interest on loans, how is it you think these people are loaning money at “zero percent interest?” Is it possible the pricing of the item has the interest rate built into it? I think the chances of that are pretty high. If not that, companies offering this kind of financing have very accurate and highly researched data that tells them the vast majority of people who take out zero-percent loans don’t pay off the loans in the specified period of time. Do you know what happens if you don’t live up to the terms of those contracts? It becomes a regular loan, and they back charge you for the interest. So, on average you’re paying for it all. I don’t know why you’d want to play with snakes, Detrick. Snakes bite, and some of them can kill you. Avoid debt like the plague. It destroys your most powerful wealth-building tool—your income. 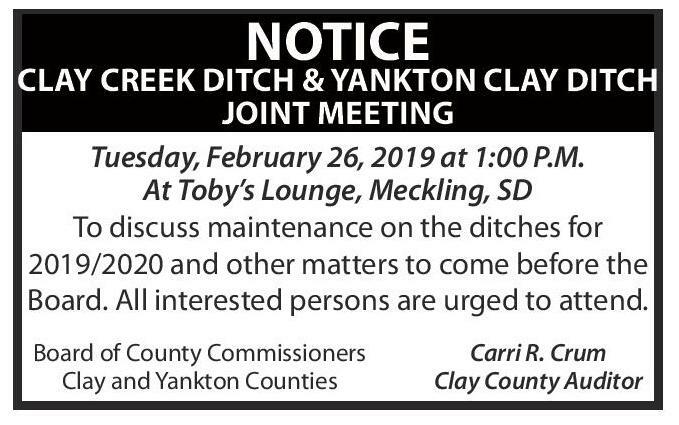 —Dave RAMSEY NOTICE CLAY CREEK DITCH & YANKTON CLAY DITCH JOINT MEETING Tuesday, February 26, 2019 at 1:00 P.M. At Toby’s Lounge, Meckling, SD To discuss maintenance on the ditches for 2019/2020 and other matters to come before the Board. All interested persons are urged to attend. Board of County Commissioners Clay and Yankton Counties Carri R. Crum Clay County Auditor Explaining the Envelopes Dear Dave, I’ve listened to you for a little while, but I was wondering about the envelope system you recommend. How does it work? Danielle Dear Danielle, Don’t let the word “system” intimidate you. It’s just grandma’s old-fashioned, common sense way of budgeting money. Back in the day, many people were paid in cash at their jobs. Then, they would take the money home and divide it up into different envelopes. The envelopes held cash for different categories in their budgets—food, clothes, rent, and other bills and such. When a particular envelope was empty they stopped buying that item, because the money budgeted for that category was gone. If you wanted a dress, but the clothing envelope was empty, you didn’t buy a dress that month. It’s just a simple cash system that, combined with doing a written monthly budget, will help keep you from overspending! —Dave * Dave Ramsey is America’s trusted voice on money and business, and CEO of Ramsey Solutions. He has authored seven best-selling books, including The Total Money Makeover. The Dave Ramsey Show is heard by more than 12 million listeners each week on 575 radio stations and multiple digital platforms. 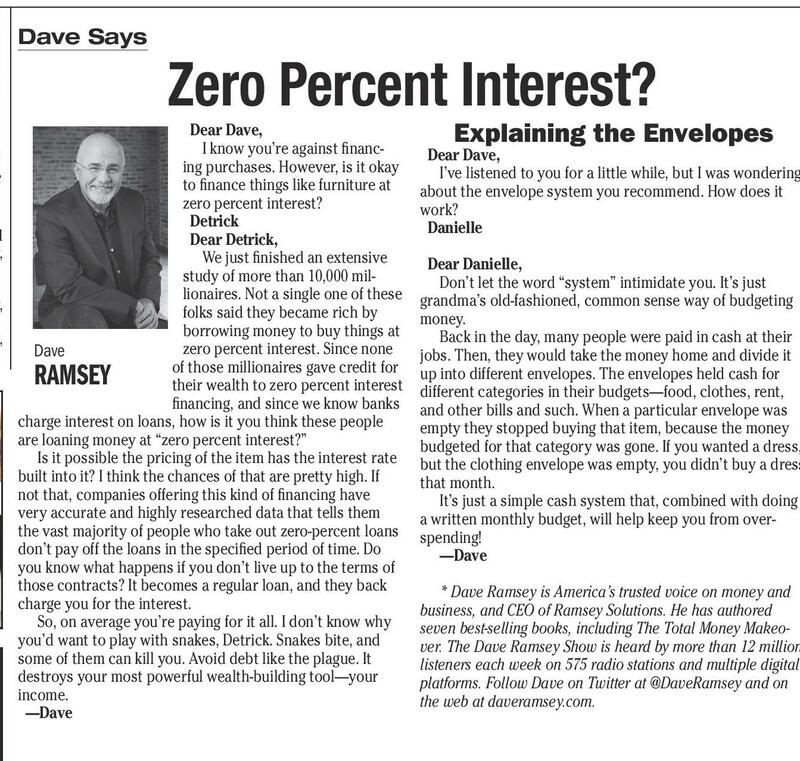 Follow Dave on Twitter at @DaveRamsey and on the web at daveramsey.com. 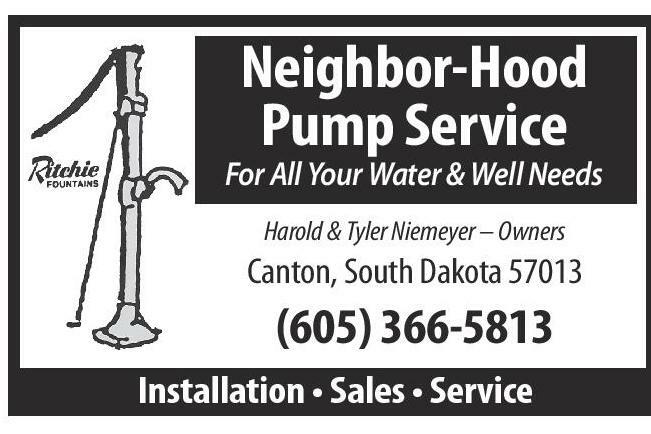 Neighbor-Hood Pump Service For All Your Water & Well Needs Harold & Tyler Niemeyer – Owners Canton, South Dakota 57013 (605) 366-5813 Installation • Sales • Service School Board Recognition Week February 18-22 2.50 2.65 2.80 1-year Grain Bin Dealer 2-year 3-year IRRIGATION SALES & SERVICE Irrigation PVC, Wire Installed, Well Drilling Domestic & Irrigation Pump Installation WATERLINE & ELECTRIC TRENCHING Tree & Concrete Removal, Site Clearing, & Ditch Trenching ALL TYPES OF DIRT WORK - FREE ESTIMATES Bobcats • Crane • Dozers • Excavators • Grader Grain Trailer • Scrapers • Side Dumps • Trenchers Vermillion, SD (605)670-9567 Hartington, NE (402)254-2568 Licensed in SD, NE & IA Minimum deposit $5,000 The Vermillion School District will join districts across the state to thank school board members for their leadership and service to our local school district and community during South Dakota School Board Recognition Week from February 18-22. Minimum deposit $5,000 “This is a great opportunity to recognize our school board for their dedication to our children and our community,” Superintendent Alvey said. 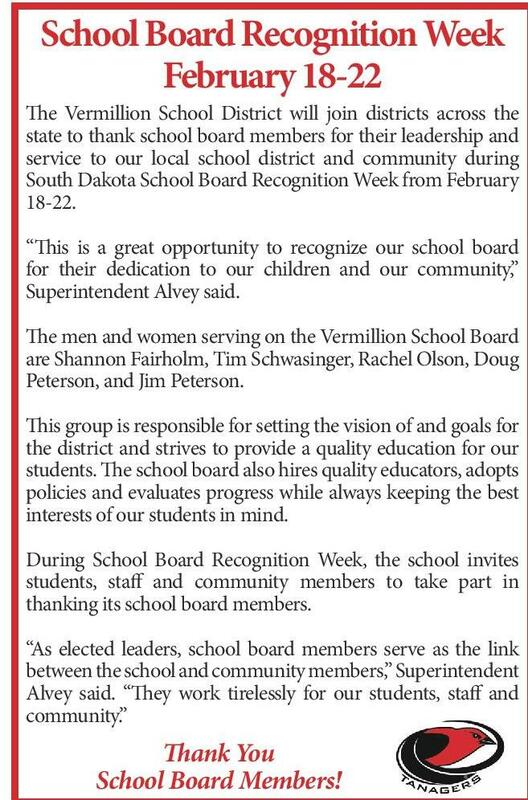 Minimum deposit $5,000 The men and women serving on the Vermillion School Board are Shannon Fairholm, Tim Schwasinger, Rachel Olson, Doug Peterson, and Jim Peterson. * Annual Percentage Yield (APY) effective 02/14/2019. CDs offered by Edward Jones are bank-issued and FDIC-insured up to $250,000 (principal and interest accrued but not yet paid) per depositor, per insured depository institution, for each account ownership category. Please visit www.fdic.gov or contact your financial advisor for additional information. Subject to availability and price change. 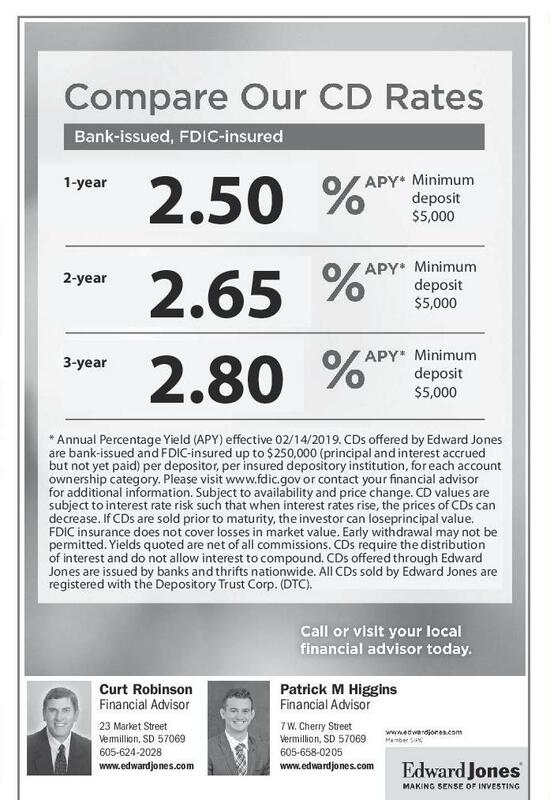 CD values are subject to interest rate risk such that when interest rates rise, the prices of CDs can 3.5” x decrease. If CDs are sold prior to maturity, the investor can loseprincipal value. 2.5” | Maximum Font Size: 30 pt 3.5” x 2.5” | Maximumdoes not cover losses in market value. Early withdrawal may not be FDIC insurance Font Size: 30 pt permitted. Yields quoted are net of all commissions. CDs require the distribution of interest and do not allow interest to compound. CDs offered through Edward Jones are issued by banks and thrifts nationwide. All CDs sold by Edward Jones are registered with the Depository Trust Corp. (DTC). Have 403(b) Have 403(b) Financial strategies. Financial strategies. questions? Let’s talk. questions? Let’s talk. One-on-one advice. One-on-one advice. CurtCurt Robinson Robinson Financial Curt Financial Curt Robinson Advisor CurtRobinson Advisor Robinson . . Financial Advisor Financial 23 Market Street Street Advisor Financial 23 Market Advisor Vermillion, SD 5706957069 Vermillion, SD 23 Market Street 23 Market Street Street 605-624-2028 23 Market 605-624-2028 Vermillion, SD 57069 Vermillion, SD 57069 www.edwardjones.com Vermillion, SD 57069 www.edwardjones.com 605-624-2028 605-624-2028 605-624-2028 www.edwardjones.com www.edwardjones.com www.edwardjones.com Patrick M Higgins Patrick M Higgins Financial AdvisorAdvisor Financial 7 W. Cherry Street Street 7 W. Cherry Vermillion, SD 57069 57069 Vermillion, SD 605-658-0205 605-658-0205 www.edwardjones.com www.edwardjones.com This group is responsible for setting the vision of and goals for the district and strives to provide a quality education for our students. The school board also hires quality educators, adopts policies and evaluates progress while always keeping the best interests of our students in mind. During School Board Recognition Week, the school invites students, staff and community members to take part in thanking its school board members. “As elected leaders, school board members serve as the link between the school and community members,” Superintendent Alvey said. “They work tirelessly for our students, staff and community.” Thank You School Board Members!